Service Costs > How Much Does Michaels Custom Framing Cost? How Much Does Michaels Custom Framing Cost? 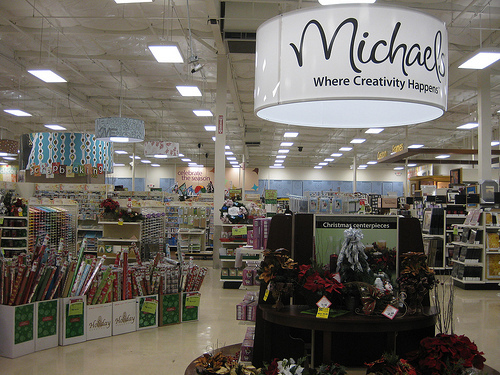 Michaels, one of the leading arts and crafts stores, has customized framing departments in every store to help with your framing needs. This customized framing can be any shape, size, color, or material that you want, and it can be matted or fill the whole frame. How much does custom framing cost at Michaels? With any custom framing job, the costs will depend on the type of frame you choose, the glass, matting, style and the size of the picture. Based on the research done online, most Michael’s custom framing jobs are going to be between $125 to $250 for a basic double matted frame made of mid-grade materials. Keep in mind that larger customized jobs that use higher grade materials can cost significantly more. For example, a picture the size of a full couch could cost $350 to $500 to frame. If you want a true estimate, head into a local store with either your picture or a good description, or you can contact them online by following this page. The sales staff will be able to give you a quote on the spot. On this MetaFilter.com thread, members discussed how much they spent at a local Michaels for custom framing. A few members stated that they had paid anywhere from $175 to as much as $400 for a job. In particular, one member stated that they paid $175 for a 16×30 and 18×24. Both of these frames were double matted. On this Gardenweb.com forum thread, a member said they had paid $75 for a 10×12 frame. On that same thread, another member said they paid $350 for a 17×22 picture. Michaels offers more than 480 matte colors to choose from and over 540 frame styles in stock. The average job, as long as you don’t choose the expedited option, will take up to 14 days. The store uses state-of-art preservation technologies that are implemented by their certified framing specialists. If you are not satisfied with the work, the store is more than happy to fix it for no charge. The custom frame express option, which can frame a picture in less than seven days, can cost more. If the frame needs to be engraved, the costs can range from $15 to $30 depending on the number of letters that have to be engraved. There are some people that like to have their pictures professionally hung. This will ensure that they are evenly spaced, straight, and aesthetically appealing in your home. Every Michaels is going to be different when it comes to the framing. Since they do the framing in house, one job may be a lot different than one location. Before getting a picture framed, be sure to ask the employee what kind of experience he or she has and how long they have been doing it. According to company policy, the store will not be able to make any cuts to artwork, especially if it has an autograph on it. If you want your picture trimmed to a specific size or shape, you will have to do this yourself before you take it in. If you are framing something simple like a family photo, you are better off to purchase a frame and do the job yourself. If something happens to the picture, you can easily print another copy. However, if the piece you are framing is a work of art or something of high value or sentiment, you should stick with custom framing. Michael’s will use acid-free materials and matting to ensure that the picture stays in mint condition. Michaels always has coupons in its store ads and online through email and text alerts. Always make sure that you look for a coupon before getting anything framed. The most common coupon is 60% off your framing order. On Coupons.com, you can often find this coupon. Michaels is not always the cheapest option in town. Make sure that you get at least three to five quotes before committing. Check out Yelp or even Google to find reputable professional framers or online with reputable retailers such as PictureFrames.com. From many reviews we glanced at online, they tended to be the pricier option. Bulk discounts may apply for larger orders. If you have a cheaper quote elsewhere, the store may be able to match it if it is within reason. The store is able to frame items with the standard frames in stock. If you use the standard frames, the costs will be significantly lower. If the initial quote is too high, work with the framer to see if they can bring the price down by using clearance frames. It is possible to do the framing job yourself and still have it look professional. You can purchase the prefabricated frame of your choice, purchase matting at Michael’s or another craft store, and then trim the picture if needed to make it fit. Doing the job yourself can save you up to 50%.